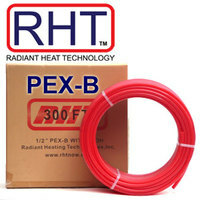 PEX tubing from RHT is your best choice for in-floor radiant heating. Our tubing is a crosslinked polyethylene PEX pipe (Pex-B) created with the silane cross-linking method (similar to Zurn Pex and Watts RadiantPEX). It fully meets today's strict ASTM F 876 and 877 standards for PEX radiant tubing. RHT Radiant PEX is produced with a strong Oxygen-Barrier and can be used with either ferrous or non ferrous systems. Coil lengths: 300ft, 500ft, 900ft, 1,000ft. Free Shipping on all Pex Tubing in lower 48 states. UN-100-R Tools That Rock PEX tubing uncoiler Rental for up to 1" pipe. Folds into sturdy metal carrying case.